One of the sweetest flowers in spring gardens is the Columbine. Columbine plants (Aquilegia) have an airy appearance, with small, rounded leaves and tall flower stalks that hold the blooms above the foliage. Aquilegia's bell-shaped flowers are popular with hummingbirds, bees, and gardeners. The mid-spring blooms fill the void between early spring bulbs and peak garden season. You can start Columbine flowers from seed or plant. Seeds can be direct sown throughout spring. The seeds need light to germinate, so simply press them on the soil surface and barely cover with soil. Because Aquilegia is a perennial, it will take two years from planting the seeds, for them to bloom. Most varieties of Columbine plants will bloom for at least four weeks. They are tougher plants than they appear, but they tend to be short-lived perennials. However, they will seed and spread, remaining in your garden for years. For the best flowering and healthiest plants, a spot in partial shade is ideal. Columbine plants can handle full sun in spring, but after they have flowered and are re-building their store of energy, they appreciate some shade in summer's heat. Columbine plants should be planted with their crown at soil level. 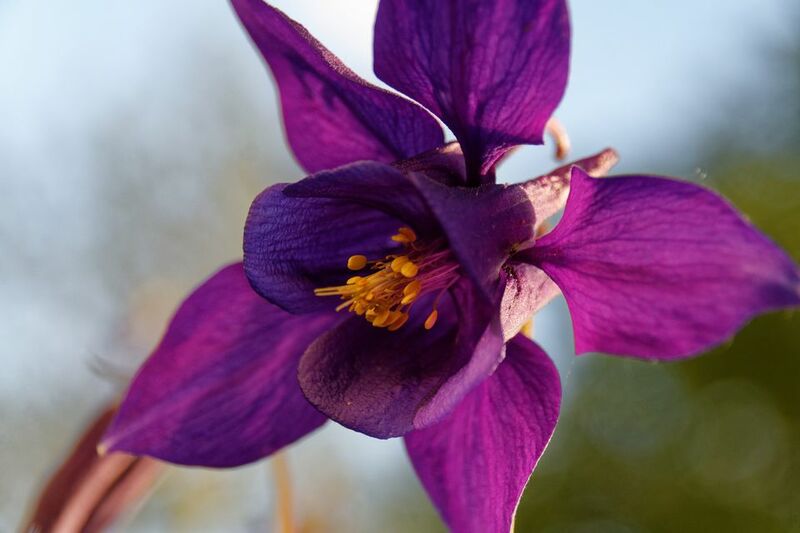 Any type of soil can be used to grow columbine plants, though it does better with sandier, loamier soils and not quite as well with heavy clay soils. New plants will need to be kept moist until they become established. You'll know they are established when they start putting out a lot of new growth. Even then, keep your Columbine plants well water during dry spells. Columbine is sensitive to high temperatures, and cooler weather will produce more flowers. Fertilize the plant with a water-soluble formula monthly. This will encourage thick foliage and bright flowers. Columbine doesn't propagate easily, as it has deep roots. If you must divide, dig down as deeply as possible in a circle around the roots, pull it up without breaking the soil ball, and divide it quickly with a sharp instrument. Retain as much of the soil around the roots as possible, and replant quickly. Aguilegia 'Crimson Star': Features long-spurred, crimson red flowers, and blooms for four to six weeks in late spring to early summer. Aguilegia 'McKana Hybrid': Grows long-spurred, bi-colored flowers that can be blue and white, red and yellow, or other color combinations, and blooms in the late spring to early summer. Aguilegia caerulea (Rocky Mountain Columbine): Features a fern-like foliage that is grayish-green in color, and blooms for four to six weeks in the late spring and early summer. The flowers have violet-blue sepals, white petals, and yellow stamens. Columbine plants are considered minorly toxic to animals. Ingestion might cause vomiting, diarrhea, or other minor illnesses. Encourage additional flowering by deadheading the plant regularly to get rid of faded looms. If there's an issue with self-seeding, cut back the foliage and seedpods in the fall months. It's not hard to grow Columbine flowers from seeds, but be aware that it's a biennial plant that will not blossom until year two. Additionally, the seeds need a three- to four-week cold spell before germination will occur, which you can ensure by keeping the seed packets in the refrigerator before sowing. Plant the Columbine seeds in moist soil in a warm, sunny location. It will take the seeds about 30 days to germinate. Once the seedlings develop a pair of true leaves and have reached 3 to 4 inches tall, transplant them outside. You can use Columbine plants in containers, but they'll need regular watering. Give the flowers a shallow container—they don't like deep soil beds—and a rich potting mix. Space the plants at least 1 foot apart, and layer a bit of mulch around the base of the plants. Place the containers somewhere where hummingbirds will feel welcome, such as a window, because this is one of their favorite plants.